Spills happen no matter how hard you try to avoid them. That's why it is important to have the right sorbents on-hand when these spills occur. SpillTech has a Spill Kit for any size and type of spill — anywhere. Spills happen no matter how hard you try to avoid them. Forklifts knock over drums, tanks are punctured and transporters leak and drip. It is important to have the right sorbents on-hand when these spills occur to eliminate the slip-and-fall hazard. A quick response is the first order of business — and your best weapon — in the fight against spills. 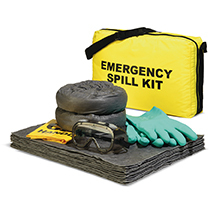 SpillTech® Spill Kits are packed with quality SpillTech® Products to help you clean up fast and comply with regulations. Spills happen no matter how hard you try to avoid them. Forklifts knock over drums, tanks are punctured and transporters leak and drip. It is important to have the right sorbents on-hand when these spills occur to eliminate the slip-and-fall hazard. A quick response is the first order of business — and your best weapon — in the fight against spills. 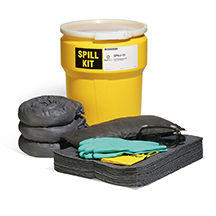 SpillTech® Spill Kits are packed with quality SpillTech® Products to help you cleanup fast and comply with regulations.